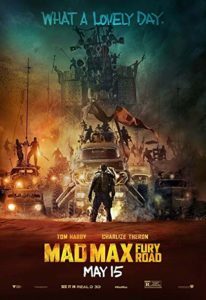 This week, the Digital Drive-In Podcast is covering the modern action classic Mad Max: Fury Road from 2015. Both Alex and Garrett agree that it’s the definitive modern action film that all others are to be judged against. What makes this one so special? You’ll have to tune in to find out! What a day, what a lovely day! Mad Max: Fury Road stars Tom Hardy, Charlize Theron, Nicholas Hoult, and Hugh Keays-Byrne. Witness Alex as he discusses the world of Mad Max and where this fits within the mythology. Listen as Garrett loves the fact that so much of the effects are practical. So fill up with gasoline and rev those V8 engines to the Digital Drive-In.